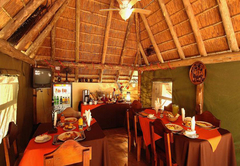 Bothabelo Bed and Breakfast is a highly recommended Phalaborwa Bed & Breakfast providing accommodation in 9 guest rooms for tourists visiting the Valley of the Olifants region. 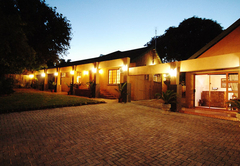 Bothabelo B&B offers affordable and peaceful accommodation only 2km from the world famous Kruger National Park where local and international tourists can centrally base themselves to explore all the highlights of Limpopo and Mpumalanga. 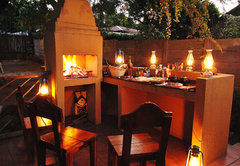 The B&B is quietly situated on the outskirts of Phalaborwa, Limpopo. You can relax at our stylish, thatched Lapa which is the perfect preferred venue on a hot summers day. Bothabelo B&B provides air conditioned rooms with garden views. All rooms are elegantly decorated with light fabrics. Each room at Bothabelo Bed and Breakfast has with a private entrance, mini bar fridge, aircon, mosquito net, work desk and free Wi-Fi. 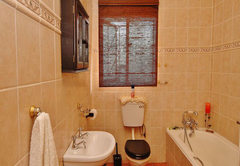 There are also coffee / tea facilities and a private bathroom with a bathtub or shower. 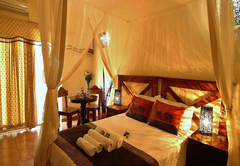 The room has either one King size or two ¾ beds and an en-suite bathroom with shower. 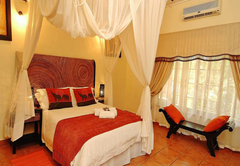 The room has two ¾ beds and an en-suite bathroom with shower. Extra beds can be provided for children if required. This room has a double bed and an en-suite bathroom with shower and bath. Extra beds can be provided for children if required. 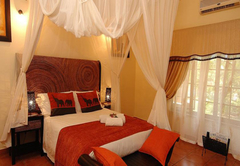 The room has a King size bed and an en-suite bathroom with shower. Extra beds can be provided for children if required. The room has a double bed, two single beds and an en-suite bathroom. The chalet has three bedrooms and two en-suite bathrooms. Breakfast is served daily in the garden or the dining room. Lunch, dinner and room service is available on request. Airport shuttles can be arranged to the Kruger Park Gateway Airport, a three minute drive away. Free private parking is also provided. We have a beauty spa in our facility as well as a conference facility that can accommodate 25 people. Double room with a King size bed or two 3/4 beds as well as an en-suite bathroom. Twin room with 3/4 beds, extra beds can be arranged for children. The room also has an en-suite bathroom. Luxury room with double bed, (extra beds for children can be arranged). The room also has an en-suite bathroom. 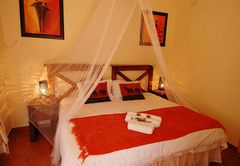 Honeymoon room King size bed (extra beds can be arranged for children), and an en-suite bathroom with shower.